There should be few devices more essential for a small office than a multi-function printer. Instead of having separate fax, document scanning, copying and printing devices taking up space and money, all these functions can be integrated into a single box the size of a typical laser printer. As you might expect, such devices can suffer from the 'jack of all trades, master of none' syndrome. Especially at the lower end of the price scale, MFPs (Multi-Function Printers) tend to be cumbersome to use and expensive to run, while often delivering sub-par results. On the bright side, the quality of these devices has improved considerably over the last couple of years, and prices are still very reasonable for what consumers are potentially getting. 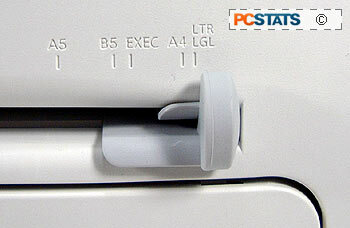 Even the best of these devices will not replace the full functionality of high-end individual scanners, copiers, etc. but for most office tasks they are more than suitable. The Samsung SF-565P not only sports the copying, faxing and document scanning features you'd expect from an MFP, but it also features a fully-fledged monochrome laser printing engine. The Samsung SF-565P's major selling points are its claimed 17ppm laser printing and copying speed, speedy 33.6k fax modem and spacious 250 sheet paper tray. All of these are features that will gladden the heart of potential users, especially those with a lot of paper to chew through. Let's see how this Samsung MFP measured up in our test lab. 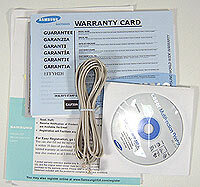 Quick-start guide, starter toner, software, power cord, phone cord. *No USB or printer cables included. - Power consumption: 300 watts printing, 85 watts standby, 10 watts idle. - Paper: 250 sheet cassette paper tray for letter to legal size, single sheet manual feed for standard paper, envelopes, labels transparencies, etc. The printing engine has a resolution of 600x600, which is absolutely typical for SOHO laser printers and should result in crisp document reproduction. Print speed is paced at 17ppm for letter paper at 5% coverage (16ppm A4) with a first page out time of about 12 seconds from standby and less than a minute from power off. Duplex printing must be done manually. The monochrome document scanning engine uses a native 200x200dpi resolution suitable for text documents. This can be digitally enhanced to 1200x1200dpi, but is not going to compare to a stand-alone flat-bed scanner for image processing. A document scanner processes paper documents in the same way a fax machine does, and should not to be confused with a flatbed photo scanner which operates in a completely different manner, and is capable of much higher resolutions. The photocopying engine combines the capabilities of the onboard printer and document scanner, resulting in a native 200x200dpi resolution. This can be enhanced to 300x300dpi as well as 16ppm output (after a 30-second scan delay). Copies can be zoomed in or out from 50%-150%. The SF-565P's fax capabilities start with it's 33.6Kbps modem, twice the speed of typical fax devices. When connected to another 33.6Kbps fax, this will speed document transfers considerably. 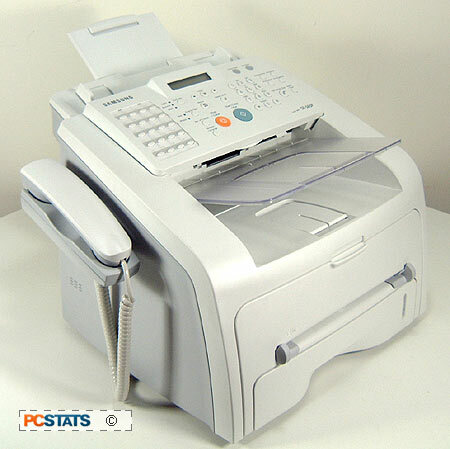 When connected to a typical fax machine, it won't make the slightest difference. Standard fax resolution is 203x92dpi, which can be increased to a maximum of 203x392dpi. 2MB of the SF-565P's memory is reserved for faxing, allowing approximately 160 document pages to be stored at standard resolution. The printer sports a full handset on the side and twenty one-touch dial buttons for quick connection. A spacious 250-sheet paper cartridge which can hold letter, A4 and legal paper. A single sheet manual feed slot accepts envelopes, labels, postcards and transparencies too.